It’s estimated that only one of 1,000 turtle eggs laid survive to adulthood. Conservationists are trying to protect turtles from a wave of threats, including pollution. WATAMU, Kenya — The young hawksbill turtle was accidentally caught in a net in the Indian Ocean off Kenya’s coast. 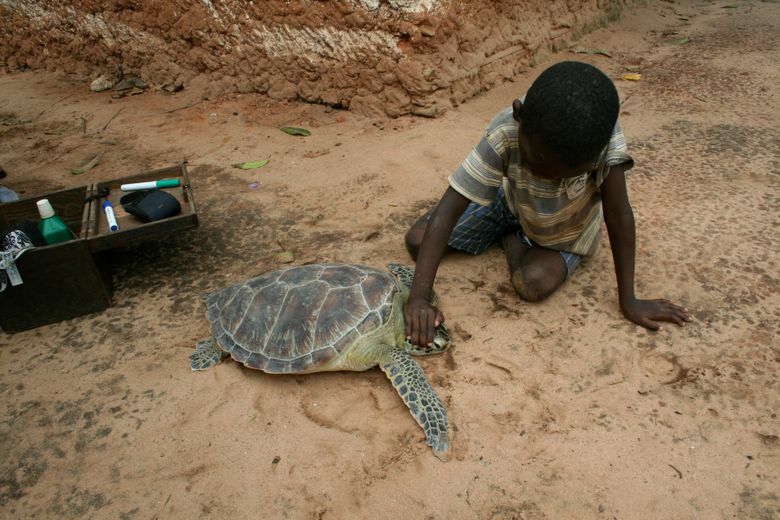 The fisherman called Local Ocean Conservation, a nonprofit based in the town of Watamu that is the only turtle rescue and rehabilitation center on the East African seaboard. The hawksbill, critically endangered in this region, was a mere 7 pounds; adults can weigh up to 160 pounds. X-rays showed that the reptile’s intestinal tract was clogged with plastic. Hogaar, as Local Ocean named her, floated and couldn’t dive. Gas had built up in her innards after she had eaten small pieces of plastic mistaken for food such as jellyfish. Local Ocean staff members placed Hogaar in a rehab pool and gave her laxatives. She passed feces laced with shreds of packaging and had little appetite. After more than four months at Local Ocean, Hogaar died. A necropsy revealed her gut was also full of sharp shards of white, blue and pink plastic and tangles of blue and gray string. Turtles are reptiles that have existed for at least 110 million years and survived the mass extinction that killed off dinosaurs. But today, sea turtles worldwide are threatened with extinction. And it’s estimated that only one of 1,000 turtle eggs laid survive to adulthood. Worldwide, hawksbills are critically endangered, while green and loggerhead turtles are endangered, according to the International Union for Conservation of Nature. Olive ridleys and leatherbacks are vulnerable. All five species of these sea turtles are found in Kenyan waters. The global green-turtle population has declined by an estimated 50 to 70 percent since 1900. Conservationists are trying to protect turtles from a wave of threats, including pollution. Since its founding in 1997, Local Ocean has protected about 1,000 nests, conducted more than 17,000 turtle rescues and treated more than 480 turtles in its rehab center. About 60 percent to 70 percent of turtles are released back in the ocean. Ten to 15 percent of the center’s turtle patients are sick from eating plastic. Most of them do not survive. Spiky papillae lining turtles’ throats prevent them from regurgitating plastic. And surgery on gastrointestinal tracts is difficult to do if it requires breaking open their shells. Because some turtles presumably die in the ocean, there is no reliable estimate of how many are harmed by plastics. But there is no doubt plastic pollution is growing; three-quarters of marine litter is now composed of plastic, and tons of plastic waste get dumped into the ocean every year, according to a 2017 report from the U.N. Environment Assembly. An obscene rainbow of plastic debris washes up on Kenya’s beaches, drifting there from as far away as Madagascar and Malaysia according to labels still legible on items. Local Ocean’s volunteers collect the garbage, in sacks bulging with plastic lids, bottles, toothbrushes, yogurt cups, food packaging and more. Turtles face many other dangers, including fishermen’s hooks, boat accidents and habitat loss resulting from erosion and human construction — especially those obstructing nesting sites. They also suffer from ailments such as fibropapillomatosis, a mysterious disease that causes grotesque tumors possibly caused by pollution, and parasitic barnacles on their carapaces. Poaching for turtle meat, shells, oil and eggs is also a major threat. Just a few decades ago in Florida and Hawaii, green turtles were killed en masse for food. In Kenya, eating turtles is part of its coastal culture and the marine reptiles are a source of meat and income for families eking out a living. While poaching of any endangered species is illegal in Kenya and carries a fine of $200,000, enforcement against killing turtles is rare. While the plight of Africa’s endangered megafauna — elephants and rhinos — captures the world’s attention and resources, awareness and protection of marine life along the continent’s coastal areas are “completely overlooked,” said Nicky Parazzi, a founder of Local Ocean, which was previously called Watamu Turtle Watch. One bright spot is the decline of poaching in the Watamu region, despite the big profit fishermen can make from selling oil and meat. A large female green turtle can yield up to 170 pounds of meat and up to 45 pounds of fat. Such a turtle can fetch $500 to $600 — a hefty sum considering the average fisherman here makes about $150 a month. Turtle oil sells on the black market for 2,000 shillings ($20) per bottle and is falsely believed to boost strength and immunity, cure asthma and serve as an aphrodisiac. Community-liaison officers offer practical advice about sustainable fishing, which helps reduce poaching and encourages fishermen to participate in returning turtles accidentally caught back to the sea. They dissuade people from using illegal means to fish, such as mosquito nets, poison and spear guns that kill the largest fish carrying vital eggs. The organization also promotes small businesses like raising chickens, cultivating moringa plants and other agricultural products as part of its effort to reduce the area’s dependency on fishing. One spring morning, fisherman Kai Shoka waited on a crescent-shaped beach here for Fikiri Kiponda, a turtle-watch coordinator, after accidentally catching a juvenile hawksbill. On the beach, Kiponda measured and weighed the creature, and put metal identification tags on his flippers. Although hawksbill meat is poisonous, the turtles are prized for the painterly, amber patterns of their shells. Carapaces are made into “tortoiseshell” jewelry and trinkets, although trade is illegal under endangered species and Kenyan laws. Released soon afterward, this hawksbill crawled tentatively on the sand toward waves lapping the beach. Once in the water, the turtle flapped his flippers powerfully, becoming a rippling blur as he disappeared into the turquoise waters of the Indian Ocean. The conservation group rewards fishermen for reporting any turtle bycatch: 300 shillings ($3) for small turtles and 1,000 shillings ($10) for large ones. Casper van de Geer, the organization’s manager, described the token amounts not as payments but as a way of compensating the fishermen for their time, or expenses like phone calls and transportation. “This is a small difference, but it has created a totally different attitude amongst the participants,” van de Geer said. While paying fishermen might seem to be an incentive for them to catch turtles, most fish by setting nets and waiting, making it unlikely that turtles are targeted for capture. The next morning, Kiponda drove to a village of thatch-roofed homes to pick up a 20-pound green turtle caught a day earlier by Mark Katama, 22, who had carried it home. “It’s a lot of effort because it’s struggling,” he said. “You have to be strong.” He received a $3 remuneration. 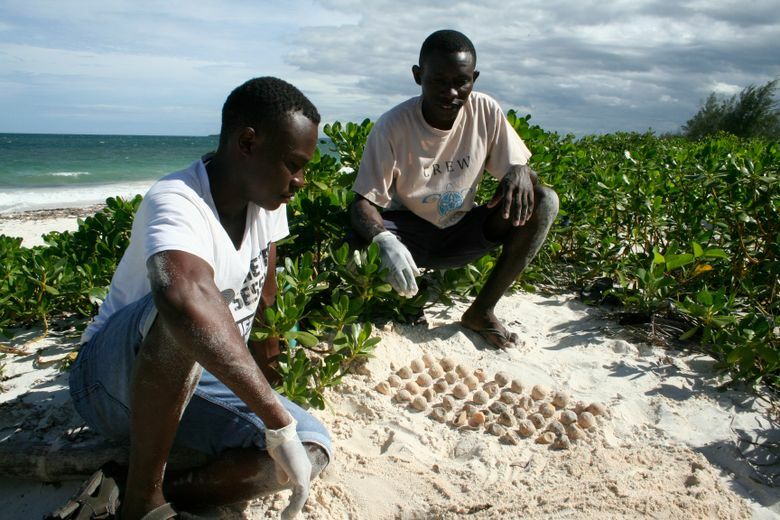 The organization now employs about 20 Kenyans, with beach patrollers monitoring and protecting turtles during the nesting season. It also visits schools, offering education programs to thousands of students. At a beachfront apartment where Zachary Kibugu works as a security guard, a green turtle crawled into a cove choked with seaweed and an obstacle course of plastic garbage: sachets of juice and hair conditioner, old flip-flops, battered tubes of sunscreen, ubiquitous bottles and a medley of caps. The marine reptile dug a deep hole in the sand and laid 128 eggs, scraping sand with her flippers over the nest to hide it, and she lumbered back to the sea. Another security guard recognized the turtle’s telltale tracks and marked the nesting spot with sticks before the tide could erase it. Kibugu alerted Local Ocean, which had introduced him to sea turtles when the organization visited his high school several years ago. Later that morning, conservationists carefully dug up the trove of luminous white eggs the size of pingpong balls. They would soon be reburied on a safer, cleaner beach where the nests could be monitored. As the staff members gingerly stacked the eggs into a plastic bucket, Kibugu remembered a Local Ocean field trip eight years ago when his class had released a rescued turtle back into the sea. The young man smiled brightly at the memory of giving the creature another chance.